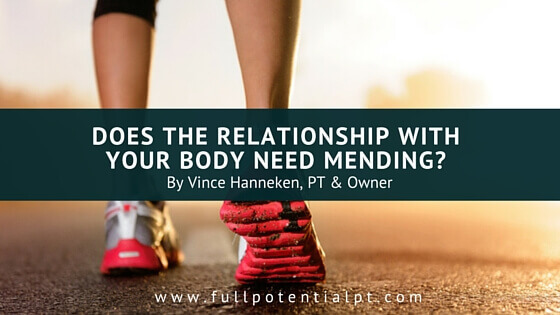 Does the Relationship With Your Body Need Mending? One of the goals at Full Potential for our patients is to get them in a better relationship with their bodies by the time they discharge. It sounds strange that we, as people, often can have the least understanding of our most intimate possession – our bodies. Yet, what do we do when we have a physical problem that we cannot solve? We go to our doctor to obtain more understanding. In PT, improving a patient’s understanding of their problem and how to care for it is key to getting a solution that lasts for our patients. We have discovered that getting a solution that lasts is partially dependent on our patients knowing how to test themselves to see if they are keeping their gains. Often, patients just use pain or tightness as it relates to their daily routine to determine if something is not right or if their particular condition is on a downturn. Yet, by the time pain is telling them something is not right, the basis for the pain has already developed significant momentum. A far more effective approach would be for someone to go and find their pain or tightness. In so doing, one can discover early in the downturn process the warning signs that something is not as good as it was last week. From here, one can push their exercises more and regain what has been lost in motion or reduce the pressure that may be causing the pain. Exercise is always more effective in handling a problem when the situation is discovered early in the downturn phase. Here is where you may be able to avoid a big interruption in your life because you caught the problem early. You were, in other words, in good enough relationship with your body to get a better understanding and take appropriate action. You might ask, how would I test myself to discover any emerging problem? Well, just go the “patients” page of our website, look under FAQs and click “How do I know if I need physical therapy”? Here each body section is listed and it describes how to test yourself to determine if you are losing some of your gains and if you have never been to us before use this tool to learn how to do a body scan to see if you are subtly losing motion that could eventually progress to a more complex problem. The goal of Full Potential Physical Therapy is always to help you learn how to help yourself more effectively.